Dr. Ojeda-Fournier is an Assistant Professor of Clinical Radiology at the Moores Cancer Center, University of California, San Diego, La Jolla, CA; and Dr. Mahoney is a Professor of Radiology at the University of Cincinnati Medical Center, Cincinnati, OH. This work is based on educational exhibits presented at RSNA 2008 and ARRS 2009: Ojeda-Fournier H, Middleton MS, Comstock, CE. 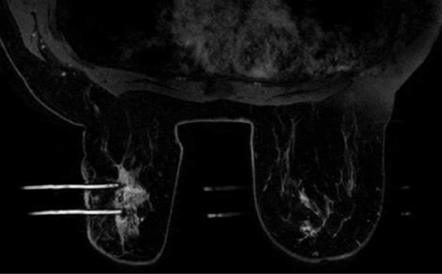 “MR-guided BreastInterventions: Pearls and Pitfalls.”Radiological Society of North America (RSNA) 2008 Annual Meeting, Chicago, IL. November 2008. 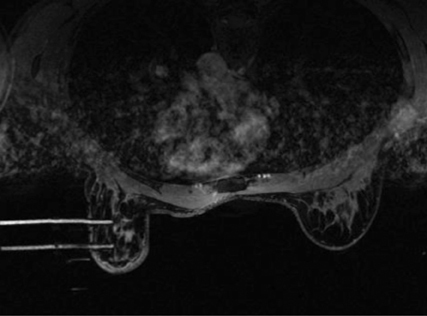 The availability of MR-guided interventions is crucial to excluding breast malignancy, especially with regard to lesions identified by breast MR which are occult by other imaging modalities and physical examination. In Part 1 of a 2-part series, we discussed the techniques for performing breast MR-guided core biopsy utilizing a grid system for lesion localization. In the second part of this series, we illustrate and discuss the potential complications and some pitfalls related to the procedure. 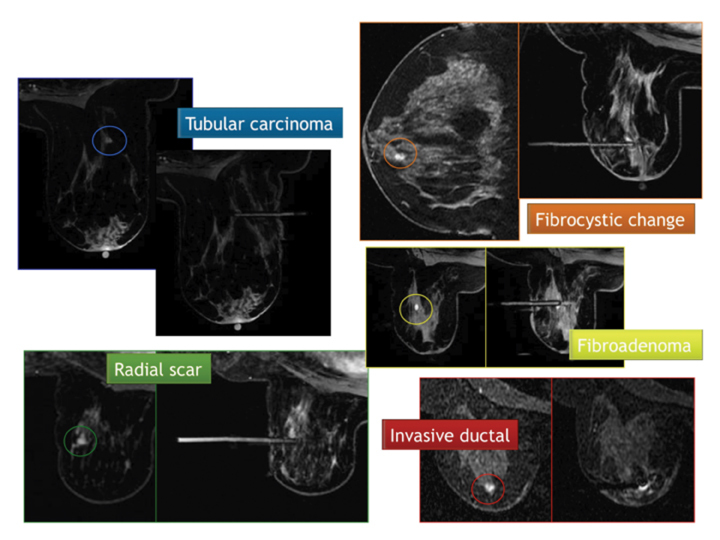 In addition, we identify the useful pearls that can potentially improve breast MRI biopsy outcome, including the importance of radiology pathology correlations and determining concordance. Bleeding, infection, and hematoma formation are potential complications of the procedure. Patients are screened before an image-guided biopsy for recent use of anticoagulants or aspirin products, and they are informed of the associated increased risk for bleeding and hematoma formation. After the procedure, direct digital pressure is applied to the biopsy site for 10 minutes to promote hemostasis. The patients are advised to refrain from heavy lifting and to wear a full support bra for the next 24 hours to help prevent delayed hematoma formation. Even with these precautions, hematomas can occur after the procedure, as seen in Figure 1. Reassurance and time are the only treatments that have been provided on the rare occasions in which a hematoma has been encountered. If the hematoma is noted at imaging postbiopsy, using the vacuum-assisted biopsy device to evacuate the hematoma, followed by direct digital pressure, can be considered (Figure 2). Although recent reports in the literature indicate that performing breast core biopsy in women on anticoagulation is safe,1 biopsy is delayed if feasible until the effects of anticoagulation are reversed. 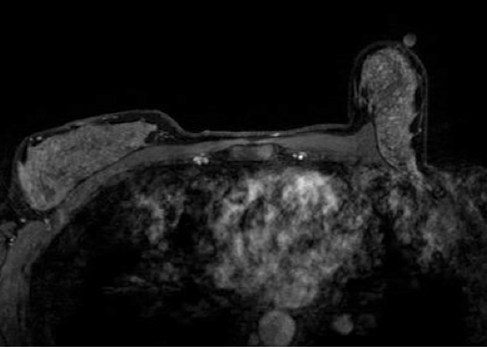 The presence of hematoma and air in the biopsy cavity, as well as contrast washout, limits postbiopsy imaging evaluation; assessment for complete lesion removal may be nearly impossible. Evaluation of the marker clip placement is not reliable, and taking time to plan and accurately localize the lesion is of paramount importance. 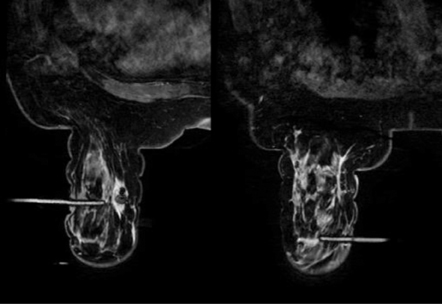 Once the biopsy is performed, further lesion evaluation will be markedly limited.Figure 3 demonstrates the typical appearance of a postbiopsy cavity with hematoma and gas present in the cavity. 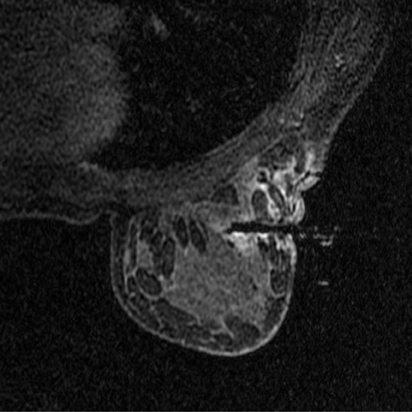 As with stereotactic biopsy, posterior lesions can present a significant challenge for MR-guided biopsy. Steps that can be taken in this situation include oblique patient positioning and removing padding material from the coil. This works well on laterally approached lesions in patients with small to medium body habitus. Caution should be taken in biopsy of posterior lesions because of proximity to the pectoralis major muscle. Inadvertent sampling of the muscle is intensely painful and can lead to marked hematoma formation. Carefully consider needle localization if the lesion abuts or lies near the muscle. At minimum, the trough of the biopsy device should be oriented away from the muscle. Posterior medial lesion access is the most limited approach since the sternum bar is lower than the lateral bar of the breast coil. In cases where the lesion is located posteriorly and medially, a lateral approach may be the only possible option. 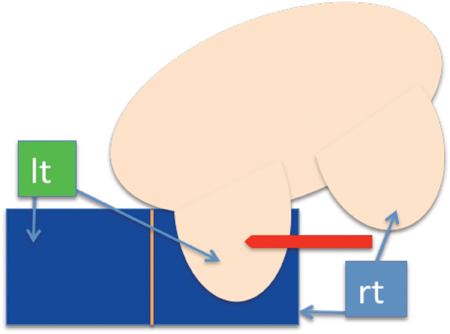 If the patient has a small body habitus, performing a medial biopsy from the contralateral coil opening would be feasible (Figure 4). The challenges of posterior lesion biopsy are illustrated in Figure 5. In this case the obturator is as far posterior as possible for a lesion within the posterior medial breast. Note that several centimeters of tissue are not accessible to biopsy because of the sternal bar support.With vacuum-assisted directional sampling toward the chest wall the lesion was successfully biopsied and yielded papilloma. Directional sampling is not possible with spring-loaded devices that need to traverse the lesion to obtain a proper sample. 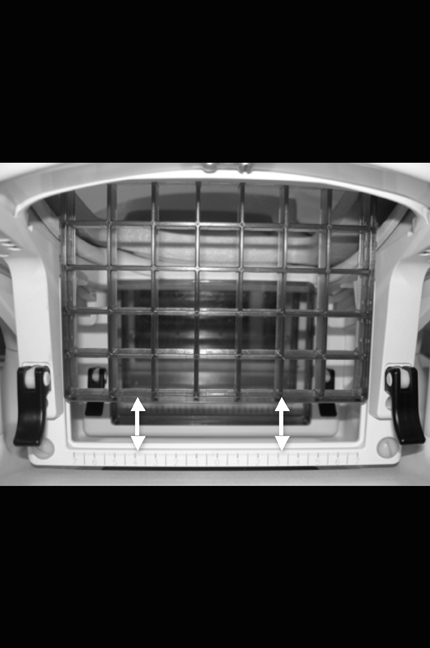 Innovations in breast coils, including a sliding lateral grid, can help access more posterior locations from both the lateral and medial approach (Figure 6). Similar to the limitations encountered with stereotactic biopsy, the very thin breast can be challenging to biopsy. Needle localization can be considered, keeping in mind the possibility of an “accordion effect.” Minimizing compression, using a blunt-tip biopsy needle (to decrease dead space), and infiltrating the tissue with lidocaine are additional strategies to consider for biopsy of the thin breast. An approach to the superficial lesion is to “puff up” the skin tissue with lidocaine to gain greater lesion depth. The guide sheath can also be used to protect the skin; however, care should be taken since vacuum can be lost. A half-sample biopsy setting is available in certain devices and allows for a decrease in the trough opening from 19 to 10 mm. Explaining the procedure to the patient and stressing that even small movement may require repositioning of the biopsy needle and add time to the procedure will often be sufficient to minimize patient motion. Significant motion (>7- to 10-mm change in lesion location) may require re-targeting. The obturator can be left in place and a new trocar/obturator inserted in the newly targeted location (Figure 8). Introducing a mammography technologist to the MR suite has been helpful and has added efficiency to our practice. The mammography technologists are experienced in setting up the breast biopsy equipment, positioning patients, assisting during the procedure, and then performing a postbiopsy mammogram for tissue marker check. The MR technologist can then focus on imaging and maintaining a safe MR environment. The greatest advantage to having the mammography technologist is the continuity of care offered when going from the MR to the mammography suite to perform the postbiopsy mammogram for tissue marker check. There is no need to double bolus with contrast or to schedule patients for a different day to perform multiple-site biopsies. Multiple or bilateral lesions can be localized simultaneously and sequentially biopsied. Multiple biopsies can be performed in one breast by inserting 2 or more needles either from a medial or from a lateral approach or by inserting a needle from the lateral and another from the medial approach (Figure 9). Bilateral lesions can be biopsied concurrently, but only from the lateral approach (Figure 9). Care should be taken to label specimen containers. For each site sampled, new biopsy probes should be used to prevent cross-contamination of samples. When a lesion is not identified at biopsy, additional delayed postcontrast imaging is performed before considering aborting the procedure. If the lesion is not identified after the additional delay, and this is confirmed in both the axial-and sagittal-imaging planes, then a follow up in 3 to 6 months is required to assess stability. As seen in Figure 10, menstrual effects and inflammatory changes can cause prominent foci of enhancement. The patient in Figure 10 has undergone additional follow up with no lesion identified at 6 months and 12 months. BI-RADS category 3 is assigned to the study to ensure proper follow-up and to avoid a delay in establishing potential cancer diagnosis. In a study by Hefler et al,2 4 lesions initially not biopsied were identified at short-term follow-up, and of these lesions, 3 proved malignant. In Hefler’s study, strong compression was suspected as the cause of limited enhancement at initial biopsy. Careful tracking of biopsy results and outcomes is an essential component of a successful breast MR biopsy program. In an identical approach, as used with stereotactic and ultrasound-guided breast biopsy, medical audit is utilized in breast MR interventions. As per the Mammography Quality Standards Act of 1999, biopsy results and tumor staging data are collected and analyzed for breast MR-guided biopsy. In a recent study by Han et al,3 a 29% cancer rate was found in women undergoing MR-guided breast biopsy. Eby and Lehman,4 in a summary of multiple published vacuum-assisted MR-guided biopsy data, reported a 97% success rate in performing the biopsy, with an overall 25% cancer yield. Once pathology results are obtained, correlation of pathology to imaging is performed and concordance is determined. Figure 11 demonstrates one approach to establishing concordance, in which the preprocedure image, the biopsy image, and the pathology report are reviewed. This process is preferably done as a group in order to obtain consensus. Histologic discordance was found in 7% of MR-guided biopsies of 342 lesions by Lee et al.5 For those patients with benign histology, a 6-month follow-up is recommended, similar to that recommended after stereotactic or ultrasound core biopsy. Those with malignant, high-risk, or discordant histology are referred to surgery. 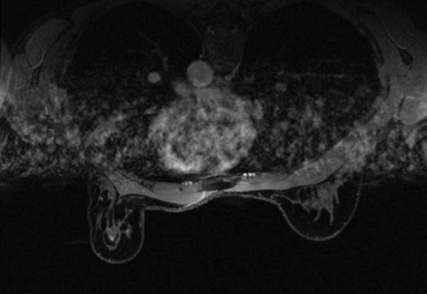 Contrast-enhanced breast MR has become an important adjunctive study in the evaluation of the breast, but it lacks specificity to establish a definitive diagnosis. 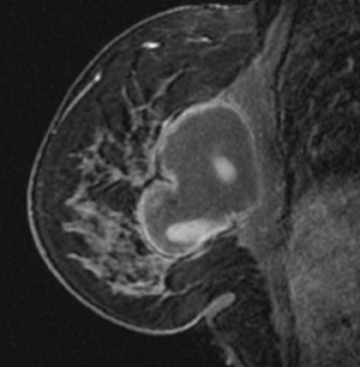 Lesions identified by MRI that are occult to conventional imaging modalities or physical examination may need to be further evaluated with MR-guided tissue sampling. 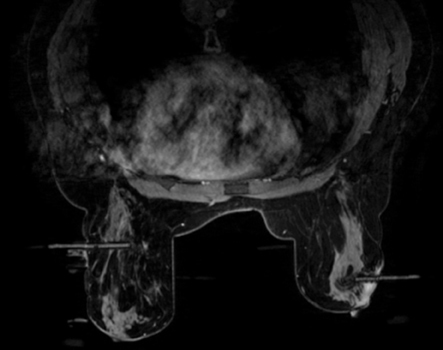 The techniques for MR-guided, vacuum-assisted biopsy and the required imaging protocols have been reviewed. Awareness of potential complications is important in the performance of this procedure. Pitfalls, including limitations caused by lesion location, motion, thin breasts, and the “snow-plow” phenomenon have been illustrated. Multiple recommendationsand discussion of medical audit and outcomes tracking were emphasized. Somerville P, Seifert PJ, Destounis SV, et al. Anticoagulation and bleeding risk after core needle biopsy. AJR Am J Roentgenol. 2008;191:1194-1197. Hefler L, Casselman J, Amaya B, et al. 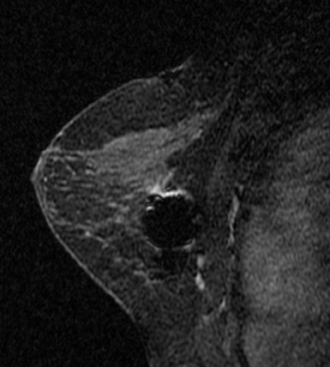 Follow-up of breast lesions detected by MRI not biopsied due to absent enhancement of contrast medium. Eur Radiol. 2003;13:344346. 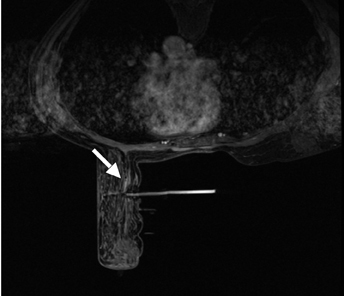 Han BK, Schnall MD, Orel SG, Rosen M. Outcome of MRI-guided breast biopsy. AJR Am J Roentgenol. 2008;191:1798-1804. Eby PR, Lehman CD. 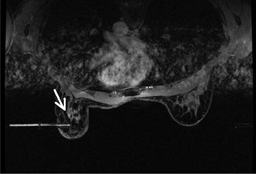 Magnetic resonance imaging-guided breast interventions. Top Magn Reson Imaging. 2008;19:151-162. Lee JM, Kaplan JB, Murray MP, et al. 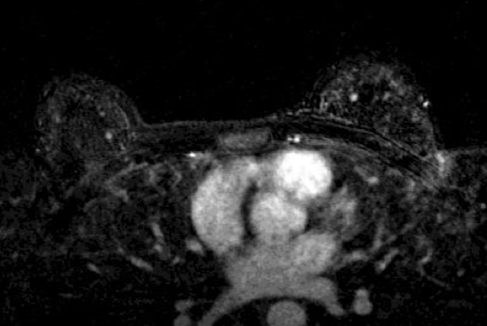 Imaging histologic discordance at MRI-guided 9-gauge vacuum-assisted breast biopsy. AJR Am J Roentgenol. 2007;189:852-859. 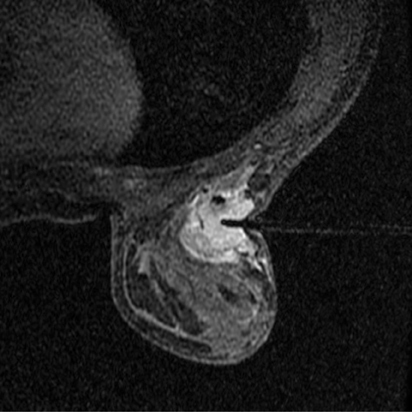 MR-guided breast interventions: Pearls and pitfalls, Part 2. Appl Radiol.